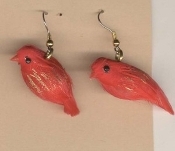 Funky Mini RED FEATHER BIRDS EARRINGS - Spring Garden Bird Watcher Birder Holiday Charm Costume Jewelry - Genuine feathered miniature gold accented scarlet Birdie charms, approx 1.5-inch (3.75cm) beak to tail. Bird body only, approx. 1-inch (2.5cm) diameter. Great gift for any Red Hat Society member!